"Admittedly, after 38 years of marriage to the force of nature that was John McCain, living without him is not an easy adjustment. 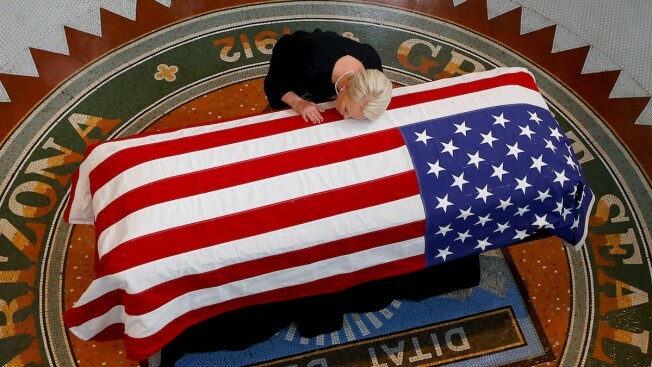 But adjust we will"
Cindy McCain, wife of Sen. John McCain (R-AZ) touches the casket during his memorial service at the Capitol on August 29, 2018 in Phoenix, Arizona. In August, Cindy McCain was with her husband of 38 years, Sen. John McCain, when the former Navy pilot, Vietnam POW, Senate maverick and presidential contender died at their home in Arizona after a yearlong struggle with brain cancer. In an exclusive essay for TODAY's Voices series, Cindy McCain recalls the tenderness of their final moments together — when, facing his favorite creek, John “(leapt) into the hereafter, like the daring aviator he’d once been” — and reflects on the resolve she feels for the work that remains to be done. “He left us our instructions, and every day I can still hear him,” she says. We had a year to prepare for life without him, a full, satisfying year, a year of reminiscences and tenderness, of public appeals and private instructions, of adding chapters to our family history — a daughter married, a son deployed — and stories to his legend. It was a year of hope and resolve, of courage and kindness, of future plans and poignant goodbyes. There were many highs and a few lows. And as we knew he would, he faced them all with grace, and the sly humor he had always used to lift our spirits at low moments — to tease us, to laugh at life’s curveballs, to make life with him so much fun. The last couple months saw a steady decline. He struggled to stay in the fight, but he knew his service in America’s cause was nearing an end. And when the end came, it came swiftly, as if he had taken the final measure of his situation and resolved to embrace it, give thanks and leap into the hereafter, like the daring aviator he had once been and the brave soul he had remained. Family and friends surrounded him. He always drew a crowd. He faced the creek he loved. A black hawk swooped low overhead and settled on the branch of a cottonwood to keep watch. Sinatra on his playlist, singing “My Way.” Goodbye. Then up our hill at sunset. A crowd waiting, as crowds would gather everywhere he traveled the next week, saluting, hands on hearts, waving flags. Services rendered with the messages and music, the friends and ceremony he had requested. He had wanted it to be a celebration of his life’s cause, his beloved country, as much as it was a tribute to his memory. He wanted to part with America on terms that would inspire us to keep the faith, to fight for our ideals. And so he did, in the illuminating accounts and funny stories of a patriot’s life, offered by friends and family and fellow Americans, in the rousing chorus of "Battle Hymn of the Republic" and the affecting lyrics of his favorite song, "Danny Boy." Our final parting the next day was more personal, a naval officer’s, a husband’s and father’s farewell on the banks of the Severn River in Maryland. There have been lots of things to do since we said goodbye to carry on the causes that had meant so much to him. The McCain Institute launched a campaign, Mavericks Needed, to engage more people in the defense of human dignity. There have been tributes intended to associate his name with good works he had admired. And my own work in the same spirit continues, fighting human trafficking, chairing the McCain Institute board, speaking out for the persecuted and threatened, enjoying and worrying about my children, and especially enjoying our grandson, Mac, otherwise known as John Sidney McCain V.
Stay busy, serve causes greater than ourselves, stay in the arena, pick fights with the bad guys, and keep faith with the little guys. Remember, as he remembered, that the bell tolls for us, and to make our life as useful to others as it is to us. After so many years of life with him, of watching and learning from his example, of seeing him fight for his country and her ideals, of loving him, I really wouldn’t know what else to do.